"It feels like so long ago now – it’s honestly a bit of a blur,” Dr. Genevieve Mortera, MD’12, said with a laugh as she attempted to recall her first few weeks of medical school. It was back in early September 2008 when Dr. Mortera first arrived for orientation week in Windsor, a city just two hours away from her hometown of London, Ontario. Like most other students entering medical school, the future physician was anxious, eager and, most of all, excited. But unlike most other students entering medical school, Dr. Mortera and her 23 classmates had an added factor to consider: the campus they were studying at was brand new. 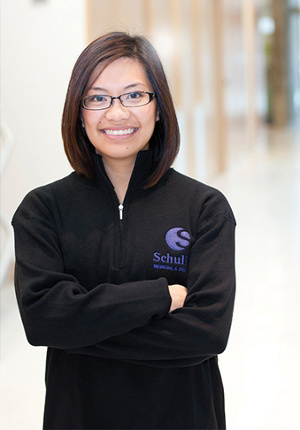 They were the first cohort of learners to attend medical school at the Schulich School of Medicine & Dentistry – Windsor Campus. After the Ontario Government identified a need for more medical school spaces, an incredible amount of time and effort was put into developing a satellite campus in Windsor. The decision was greatly supported by both universities, and members of the Windsor community celebrated that there would be a higher concentration of medical professionals in their city. The first 24 students – the Windsor Campus Charter Class – became the champions of the program. The young medical professionals were welcomed with open arms and celebrated their decision to act as pioneers for the school. But beyond the welcome celebrations and media attention, Dr. Mortera didn’t fully realize the role she had taken on as a trailblazer. “I wasn’t really aware of the magnitude of it all at the time. I was just trying my best to live in the moment and take it all in while it was happening,” she explained. Dr. Craig Campagna, MD’12, had a similar experience, which was heightened even more since he was born and raised in the city. “When you’re going through medical school, you’re just so focused on becoming a doctor. Of course it was special to be a part of the first class, especially since it was such a big deal for Windsor to get this kind of program, but I never thought about that impact until I was able to look back on the experience,” Dr. Campagna said. Establishing something new can come with its fair share of ups and downs, and the first few months of the Windsor program was no exception to this. Dr. Campagna recalls the challenge of learning how to work with the webcast from London, and attending classes in the basement of an older building on campus while they awaited the opening of the Dr. Murray O’Neil Medical Education Centre. 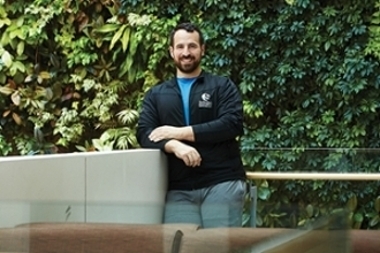 Dr. Campagna and his peers were also faced with a University strike within their first few months of study – something that was overcome with the dedication of faculty and staff, and the support of fellow classmates. These minor blips in the new program’s first year never made Dr. Mortera doubt her decision to attend medical school in Windsor. She saw them as all part of the challenge, and chose to focus on the endless benefits of the program instead. Drs. Mortera and Campagna both benefited from the smaller class size as well. “Our class was very much like a family. When you’re only 24 people, you are always together – you study with the same people, you do projects with the same people, you go out and socialize with the same people. It is very rare that you will find that kind of family mentality anywhere else,” Dr. Campagna said. It has been five years since the Windsor Campus Charter Class graduated, and the 24 students have since gone on to achieve a tremendous amount of success. Dr. Mortera has since moved to Halifax, Nova Scotia where she works as a family medicine physician, and Dr. Campagna has joined a family medicine practice in Windsor and does surgical assisting at Windsor Regional Hospital. While the majority of the Charter Class has kept in touch through personal and professional events such as weddings and conferences, Drs. Campagna and Mortera are looking forward to celebrating their five-year anniversary through a variety of celebrations.